Give Me Just 5 Minutes And I'll Show You How To Master The Fundamentals Of Safe And Effective Tackling With 100% Confidence... Even If You're Brand New To Coaching! And if you've been around the game for any length of time, you'd probably agree. Understanding that concept is one thing. Stepping into the shoes of a youth football coach, and trying to actually implement it on the field is a whole different ball game. Youth football is probably the first real "contact" sport a lot of your kids have played. Learning how to make a solid hit (without hurting yourself or your teammate) isn't something that comes "naturally" to most young athletes. Not only that, with everything we now know about concussions and chronic brain injuries, even the most experienced coaches can be a bit intimidated when it comes to introducing contact in practice. So, if you're having a hard time teaching basic tackling techniques... or finding drills that reinforce the proper fundamentals, then please don't worry. We all undertand how important it is to improve tackling skills, increase safety and limit helmet to helmet contact. But most amateur coaches have only a vague idea of HOW to do that. Your athletes are desperate to improve and need your help. Their parents are watching you like a hawk, to make sure their kids stay safe and continue to improve. And if your kids can't tackle, your competition is ready to jump all over you and crush your team by 30 points if you give them the chance. The good news is - learning the art and science of tackling isn't as hard as some people say. You just need a little guidance. But - like most "real" coaches in the trenches - you don't have time to read through dusty old textbooks or attend some overpriced coaching clinic halfway across the state. This Step by Step Guide Is Guaranteed to Transform You Into A Master of Tackling Fundamentals! Read this simple report that reveals the exact drills you need to be using in practice, and learn precisely how to teach tackling in the fastest, easiest way possible! Inside ""Tackling 101 For Youth Football," you'll learn how to introduce the fundamentals of tackling to your kids the RIGHT way..
All in a safe, risk free environment that allows them to learn the proper techniques without fear of getting hurt! A Simple A-B-C progression That ANY Coach Can Plug Into -- FAST! You'll begin with basic form tackling drills... then progress to learning about pursuit angles and tackling in space. Finally, we'll add in blockers to simulate a game situation and train your defenders to read keys and react to plays. Many of the drills are designed to run at half speed with no pads. While others can be easily modified for light or full contact when your players are ready. How to teach the basics of the head-on tackle, angle tackle, open field tackle and sideline tackle. Get simple, step by step instructions you can take right to the field... starting at your very next practice! How to train your players to win the collision by finishing THROUGH contact with a rising blow. Master this one technique and your defense will be unstoppable! How to tackle in space like a pro -- discover a nifty "Open Field Cutback" drill that dramatically improves your defender's footwork and anticipation skills. Say goodbye to those costly missed tackles! A key read drill that helps your linebackers, corners, and safeties analyze the movement of the offensive line, sniff out plays, and get a jump on the ball-carrier with lightning quick reflexes! To shorten the learning curve and really make sure you and your players "get" this stuff immediately, every drill is explained with step by step instructions, detailed diagrams, and "brain dead" simple coaching tips and pointers. So you can take this information to the field TONIGHT, and start using these drills with your team (or your son) right away. Sure, I've been studying football skill development for a long time - but I still consulted with EVERY football expert I knew, personally tried and tested dozens of different drills with my own teams, then added my own personal experiences to develop this system. Don't let the size of this short resource fool you. Over 100 hours of research (and many thousands of dollars) went into this project. I've pulled together in one simple collection the most essential tackling drills you need, to help your players reach their full potential... and help your team develop a dominant defense. The confidence you'll feel, walking onto the field at your next practice, armed with an arsenal of fun, competitive tackling drills your players will love. So if you're serious about becoming a better coach... or serious about helping your son reach his full potential.. click the Add to Cart button below now. It's just 24 pages. Short enough to read in one sitting. I've pulled together my all-time favorite drills for each of the defensive positions, and created a short, sweet, and incredibly useful "Top 5" list for each one! All the drills are designed to help your players become faster, stronger, tougher and more competitive, while reinforcing safe and effective tackling fundamentals! That's a total of 30 brand-new drills for your coaching repertoire... all hand-selected to give you the most dramatic results in the least possible time! This report is so essential I'm practically giving it away because I want to make sure you take the simple steps to becoming a master football coach, and start seeing the results right away. 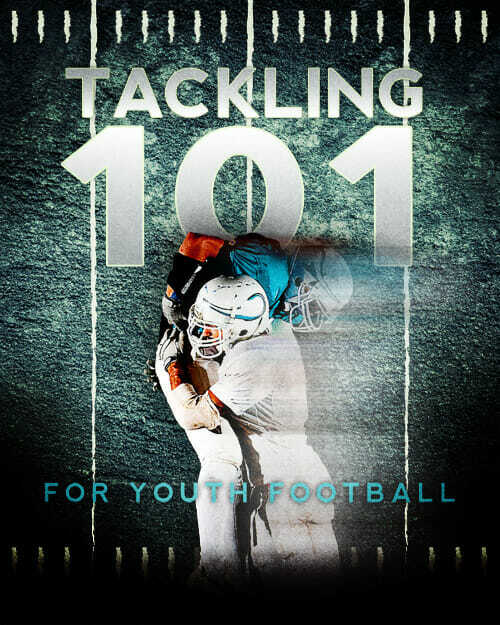 Click the Add to Cart button below to get instant access to Tackling 101 for Youth Football - Risk Free for just $7. YES, I want in! 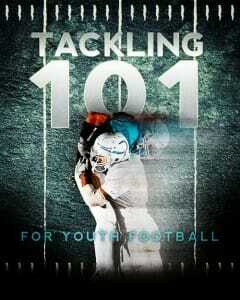 I want access to Tackling 101 for Youth Football. Please give me INSTANT access to this step by step coaching system right now! Just download Tackling 101 for Youth Football and you'll get instant access to a complete skill development system you can start using today! Tackling 101 for Youth Football now for just $7! Tackling 101 for Youth Football is primarily designed for kids under 14. It follows a progression from basic fundamentals and form tackling, to game situation drills that are more challenging for older players. So there’s plenty here for youth football teams at all competitive levels. We’ve included drills that can be done individually, with a partner, or with small group of players. So it’s great for coaches to use during team practice… OR for parents or athletes who want to work on their skills at home. I want to make sure every youth football team has a chance to succeed – so we can get more kids involved and grow this incredible game. And I know that most of our customers are volunteer coaches – with a small budget to spend on their own education and training. So we decided to make this system as affordable as possible. $7 puts the ebook within reach for the vast majority of people. It’s not expensive for even the humblest beginner. Hurry... Get Tackling 101 for Youth Football Now!